The Shadow Sabre is the perfect bike to get you to places you've only dreamed of cruising. From its 1,099 cc, 45-degree V-twin pumps serious power and the kind of torque everyone wants in a big cruiser. And when it comes to styling details, with its combination of brilliant chrome and scintillating paint schemes, the Sabre is flat-out stunning. California version differs slightly due to emissions equipment. Street-rod styling features chrome fork-leg covers, deeply valanced fenders and beautiful cast-aluminum wheels machined to a satin finish. Dragster-style seat boasts a low 27.2-inch seat height for flat-footed confidence during low-speed maneuvers. Rider comfort is enhanced with comfortable ergonomics and a firmly padded saddle. Large 4.2-gallon gas tank offers extended cruising range. Speedometer face features white background with large, easy-to-read numerals. Solid aluminum footpegs with wide rubber trim enhance the custom street-rod look. Polished aluminum handlebar switch housings and triple-clamp assembly. Low 27.2-inch seat height, comfortable dragster-style seat and semi-swept handlebar combine to create a superbly comfortable riding position. Specially designed sturdy steel frame gives the Shadow Sabre a long, low, custom stance. Large 41 mm extended front fork provides 4.7 inches of plush yet responsive travel. Dual chromed rear shocks have 3.9 inches of wheel travel and feature an advanced internal valve system for a comfortable ride. Front disc brake features a twin-piston caliper with a large-diameter 316 mm rotor. Combined with the rear single-piston caliper and 276 mm brake disc, brakes provide excellent stopping power. 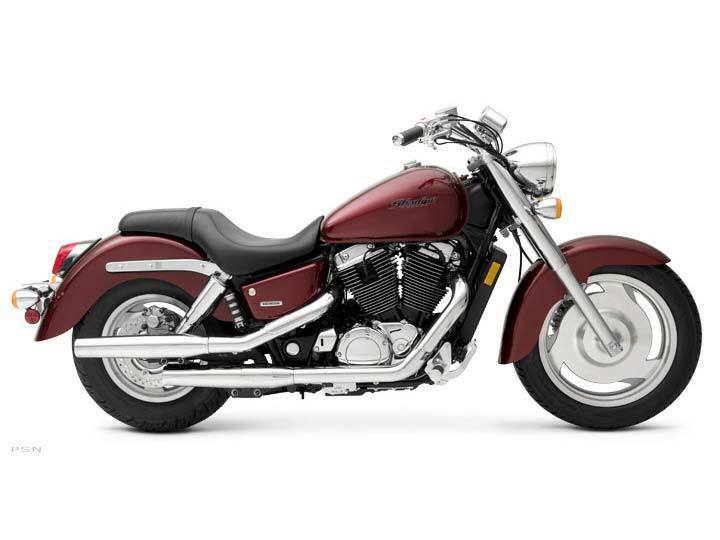 Wide, low 120/90-18 front tire enhances street-rod styling and contributes to a comfortable ride. Massive 170/80-15 rear tire offers a wide foot print and a radical custom look. The Shadow Sabre™'s engine pumps out class-leading low-end and mid-range power for superb acceleration and gratifying roll-on performance. The engine's broad power delivery provides spirited performance and exceptional rideability around town or on the open road. Rubber-mounted engine with offset-dual-pin crankshaft provides perfect primary balance, enhances engine smoothness and delivers superior rider comfort. Three-valve cylinder-head design utilizes two spark plugs per cylinder for efficient combustion and high power at all rpm. Maintenance-free hydraulic valve-lash adjusters eliminate routine valve adjustments. Other maintenance-free features include digital ignition and automatic cam-chain tensioners. Dual 36 mm constant-velocity carburetors offer crisp throttle response at all rpm. Extensive chrome finishing of engine parts includes crankcase covers, clutch cover and left-rear engine cover. Black-finished crankcases and cylinders with buffed fin edges complete the custom street-rod look. Chromed dual-exhaust system enhances appearance and produces throaty exhaust note. Reliable five-speed transmission with carefully selected gear ratios to maximize acceleration. New Candy Black Cherry and Black with Flame colors.